Day of the Dead Costumes! 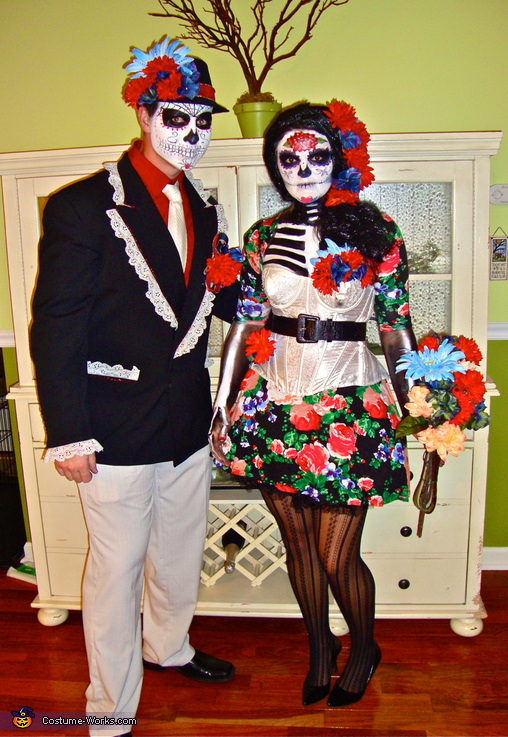 This homemade costume for couples entered our 2011 Halloween Costume Contest. The costumes are worn by me and my husband. I was learning about the holiday, Dia De Los Muertos and saw some pictures of the "sugar skull," and thought it would make an amazing Halloween costume. For my outfit: I used an old dress and put a white corset over top of it. I made a petticoat out of tulle that I bought at the fabric store and sewed it into some material to make it into a skirt. I bought a pair of striped tights. I got silk flowers at the craft store and made them into arrangements on the top, in my wig ($5 from Wal-Mart) and on the skirt. For my husband: We bought most of the costume from the Salvation Army and Goodwill, great stores to shop at for Halloween!! I hot glued lace into the coat and lined it with red sparkly paint, which you can find at any craft store. I had some old Christmas ribbon that I used on the hat and the boutonniere. The makeup: The makeup was probably the hardest part. It took a few trial runs and the night of took about 3 hours. People kept asking, "Did you do your husbands makeup and did he do yours?" Nope, all you need is a mirror and a good light, oh and a steady hand helps too! I looked up pictures of a skeleton and then drew in my hands and chest too. I bought translucent setting powder, and this really helped "set" the cream makeup so I could build layers on our faces. It didn't smear all over the place. Thank you for checking out our costumes. We did everything by hand and on a budget. They are original and unique and have a meaning behind them! This is awesome! Love what you did with the dress and how you painted your arms! Thank you for the inspiration. what is the name of the makeup you used please? I used Mehron and Ben NYE makeup :) thanks!